It’s coming. The Phoenix, racing across the galaxy with one destination in mind: Earth. As the Avengers and X-Men battle it out for control of Hope, they need milestones to guide their paths. We have two sets, one for the X-Men, one for the Avengers. In addition, the Phoenix Five have a set of custom milestones. You’ll see, this week, that our datafiles and milestones related to the Phoenix Five are orange. Enjoy. Finally, we have the Power Set for the Phoenix Force itself. This is provided in case, in your Events, different characters end up in the embrace of the Phoenix. Have fun! As an example for how this Item Power Set could be used for any character, Seamus said I should look at putting the power-set on a character who didn’t acquire the Phoenix Force. Since I can’t resist that man, I complied. Enjoy, Seamus. In addition, I’ve created two looks to the datafile. I’m looking at trying something new. I’d love to get your feedback. That Phoenix Force power set! You guys have outdone yourselves again! =D I really like the Phoenix Force as an item power set, rather than a complete character re-write, and the milestones sound fantastic for troupe play. Can’t wait to unleash a Phoenix-hosting Captain America on my poor players, haha. Concerning my feedback of the two datafiles, I prefer the look of the first version. Much easier to read. Regardless, I like the fiery orange color instead of the usual blue background. 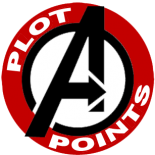 This entry was posted on September 11, 2016 by Mark in AvX, Events, Item Power Set, Milestones, Uncategorized.